Global Citizen advocate, champion of food and nutrition and philanthropist, K Naomi, chats about her style, beauty secrets and why she’s passionate about giving back. My style is fresh and innovative, sometimes edgy, other times classic, but always timeless. Style for me is my personal way of dressing, based on various influences, for example, my mood or the weather. Fashion is what influences that style, the latest trends, inspirations from culture, personalities and what's available and accessible. Five items you can’t live without? 3. A black trap sandal that can be worn with anything, for example denims, skirt or a dress. What’s that one staple piece in your cupboard? Denims. I have soooo many! What beauty essentials you swear by? Sunscreen for skin protection and water, because hydration is important! How do you decide what to wear for red carpet events? Comfort is essential to me. So if I love it and I’m going to be comfortable on the night, then I know it’s the one. 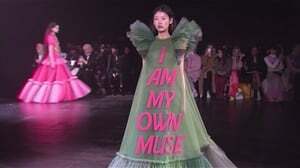 I have input in the creative design and production for all my custom clothes, so even before they are made I’ve already visualised myself in them. If I’m not happy with an outfit, then I know it wasn’t executed how I had envisioned it, which is a problem because you must like what you see, and you must feel good in the garment to confidently pull the look off. Why are you passionate about adding a change in the world? Through my work as a food and nutrition champion for Global Citizen, I was exposed to many issues that seemed completely unrelated in the cycle of poverty and what keeps people in that cycle. A lot started to make sense and because of that experience, I’ve been able to crystalise my thoughts, plan and reasons for wanting to make the world so much better than it is. Not only because we have a responsibility to care for each other and this earth, but because it's so liberating and rewarding to see someone has benefited from the collective efforts of fellow humans. ... We all respected each other.